BUDDING data wizards, coding ninjas and digital disruptors were crowned champions in a hackathon-style competition at the recently-concluded CIMB 3D Conquest Grand Finale held at Le Meridien Putrajaya. 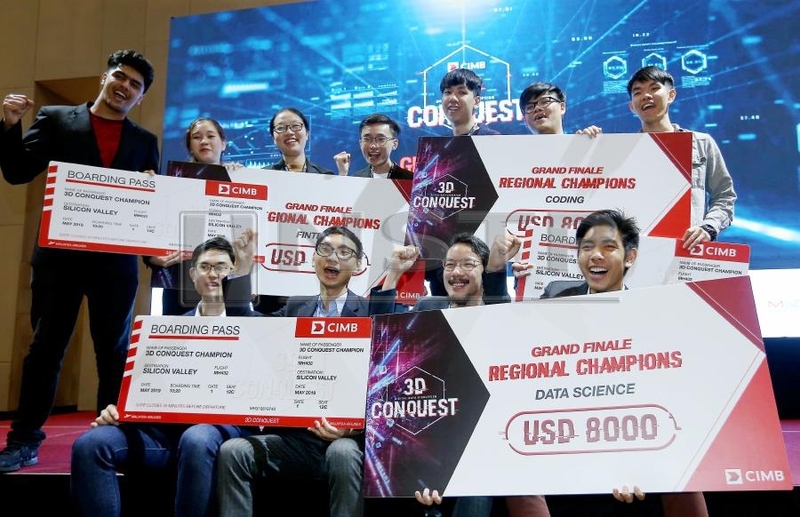 One team from Thailand and two teams from Malaysia were named the regional champions in their respective categories of Data Science, Financial Technology (FinTech) and Coding. Team Jet Et Al, from Thailand’s Thammasat, Chulalongkorn and Mahidol Universities, won in the Data Science category with their Grand Fused alternative sources of data to assess loan applicants’ credit risk to supplement existing credit risk models. Team Jake, from Malaysia’s University of Reading, which won in the FinTech category, was challenged to develop a contactless payment solution, while Team Mamadei, from Tunku Abdul Rahman University College, presented a prototype incorporating environmental, social and governance elements to win the judges’ hearts in the Coding category. Each regional champion team won US$8,000 (RM33,000) and a trip to Silicon Valley. Yeo Jia Ling from Team Jack said the competition was a little different for the team because it was a FinTech competition and none of the team members were from a coding background. Team member Avienash Vilet said the team created an app where parents could monitor their children’s expenses, with a minimal amount of financial freedom. He added that the main purpose of the team’s invention was to show that financial literacy was important and there were ways to learn it. “Based on statistics, Malaysia has a very high rate of bankruptcy. I believe if our idea is carried out well in the near future, the rate could be reduced,” he said. Yeo added that the team hoped to run their app one day so it could benefit society. Khoo Wai Kang, from Team Mamadai, said the competition thought them that it was not just about what they learned in the books, but was also about “thinking out of the box” and beyond that. “For our project, we tried to design something that is fun to use, straightforward and attractive to the users. What we thought of was, instead of using normal six-digit code for authentication, we came up with a way to include pictures—users to select one picture to authenticate themselves. It is something like a random security. We also have a second level of security,” said Khoo. He said they hoped to improve their project during their trip to Silicon Valley later. Phatrasek Jirabovonvisut, from Team Jet Et Al, said the team had to build models to determine if borrowers would default or not, and tried to adapt that into CIMB’s existing model. “Our idea was to look into existing customers and markets, as well as new markets for information. Existing customers can help us create an information model to better allocate capital for new customers, as well as personalise customer care. “For new markets, we tried to create a peer-to-peer learning platform, expanding throughout Asean. We find that this platform can be a key driver in decision-making and also leverage CIMB’s resources as a large bank in the region. We think it can be successful,” said Jirabovonvisut. Being colleagues in the field of data and business analytics,the team has a good match of business and technical backgrounds. Jirabovonvisut said trust, teamwork, good communication and delegation of work were the winning factors for the team. A total of 33 teams, involving 115 participants from Malaysia, Indonesia, Singapore, Thailand and Vietnam, received a standing job or internship offer from CIMB. CIMB group chief people officer Datuk Hamidah Naziadin said the impressive quality of the participants for the inaugural CIMB 3D Conquest boded well for developing a robust pipeline of digitally-groomed talent to support CIMB’s future growth. “CIMB’s aspirations are focused on opening up opportunities for the region’s youth. This competition has been an excellent platform to discover the participants’ creativity and mental agility in the three categories featured. “In today’s digital and data-driven era, Asean’s future prosperity depends on developing the region’s young talents with the necessary skills to leverage data, digital innovations and disruptive technology. The competition began on Sept 18, starting with 715 teams, or more than 2,500 participants. from 200 universities across Asean. Subsequently, 213 teams from seven countries made it to the country level held in Malaysia, Indonesia and Singapore. At the grand finale, a total of nine teams were selected as winners.